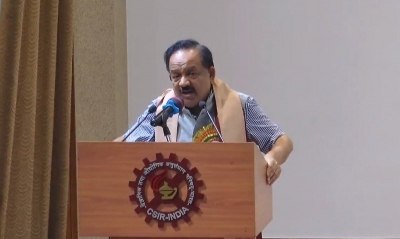 Kolkata Sep 14 (IANS) Union Science and Technology Minister Harsh Vardhan on Friday said the Central government is looking to turn the scientific progress in the country into a movement. Addressing the first curtain raiser programme at the CSIR-Central Glass and Ceramic Research Institute here for the India International Science Festival (IISF) 2018 in Lucknow from October 5-8 he said the government is planning to hold the next edition of the festival in the eastern or northeastern region. "Science should become a movement. We have been trying to engage students and youth of the country with science and research in a big way. Facilities at the various institutions are being upgraded so that the youth can access the best resources " he said. The Minister reiterated the government s commitment to make science and technology an enabler of social and economic progress for all sections of the population. "We try to promote innovative ideas which are key to India s economic and social development. We are organising the festival because we want to turn the developments in science in the country into a movement " he said. AIISF-2018 with its focal theme "Science for Transformation" was expecting to host around 10 000 delegates including 5 000 students 550 teachers 200 students from northeastern region 20 international delegates and approximately 200 start-ups. The Union Minister also launched an app for this year s event. Speaking further on the festival Department of Biotechnology Secretary Renu Swarup said: "Science is all about curiosity. The whole purpose of the festival is to take science to remote corners of the country." The first and second IISF was held in New Delhi and the third in Chennai. "Next year we would like to come here and in the north-east not for the curtain raiser programmes. I hope we will hold the next edition in Kolkata or in the north east. But it will depend on how much enthusiasm or intensity we receive from here. The organising committee will take the final decision on whether the next year s festival will be held in Kolkata or Guwahati " Harsh Vardhan said.